Representatives of the Tea Party movement will be reading the Constitution into the Congressional Record on the first day of the new legislative session and I heartily concur that more people need to know about this remarkable document. For the record, I am not a member of any organized party or movement, and I too revere the American Constitution. We have our freedoms because of it. We have fought wars and spilled blood to protect it. I got a Kindle for Christmas, by the way, and one of the first things I downloaded were the Constitution, the Bill of Rights and the Declaration of Independence. I have actually read them. Recently. Times were different then and some of it is a little anachronistic- especially the parts dealing with the tricky issue of slavery. I am curious as to which version of the Constitution will be read into the record. For example, there is a sentence in Article 1, Section 2 about how to determine the make-up of the House of Representatives and apportionment of taxes. In other words, you count free white citizens plus indentured servants, no un-taxed Indians, and slaves count as three-fifths of a person. In retrospect- not one of our prouder moments. You don’t have to actually read that sentence, though, because it was technically eliminated by the 14th amendment. We fought a really horrible and bloody war that settled all this and so it was that on July 9th, 1868, we took out the part about indentured servitude and “three-fifths of all other Persons” since, by then, slavery had ceased to exist (see the 13th amendment passed three years earlier). All persons born or naturalized in the Unites States, and subject to the jurisdiction thereof, are citizens of the United States and of the State wherein they reside. This could be a little awkward as there is a burgeoning movement within some elements of the Tea Party to repeal the 14th amendment which would end automatic citizenship for, say, the children of immigrants just because they were born on American soil. Now I understand the frustrations posed by illegal immigration and amending the Constitution is a totally constitutional act. But the reason the Constitution has been embraced as the guiding philosophy of the Tea Party movement is because of the belief that strict interpretation of the document should be adhered to and has been continually violated through the years. If you believe in strict interpretation of the Constitution, then why would you want to amend it? Unless you want strict adherance to the Constitution, except for the parts you don’t like. In any event, I suspect some lawmakers will be reading the 1st sentence of the 14th amendment through gritted teeth, though it will go by quickly. In the interests of full disclosure, I will admit I have a personal though indirect stake in this debate. As a 1st generation American born in New York City, if the 14th amendment had not existed, I would never have been granted automatic citizenship. And there’s a good chance there would have been one less American carrying the Constitution, the Bill of Rights and the Declaration of Independence in their Kindle. I was raised, in part, on the lesson that if you didn’t like something enough to speak up about it, you also had an obligation to offer a suggestion to improve whatever situation was causeing your angst. To that end, I propose that anyone supporting the elimination of the 14th Amendment should be required to revalidate their U.S. Citizenship and their right to vote every several years. If the 14th Amendment is repealed, then there should be no grandfathering of citizenship for able minded souls. Meaning, that if you have the mental capacity to question another person’s qualifications for citizenship, then you should be required to renew your citizenship and reestablish your “right” to vote every several years – the exact interval can be debated and I would exempt those under age 18 from this test. Obviously, it would be folly to deport individuals who fail to renew their citizenship, but removing their franchise to vote would be an appropriate consequence – until that time at which they could pass a middle school test on the Constitution. 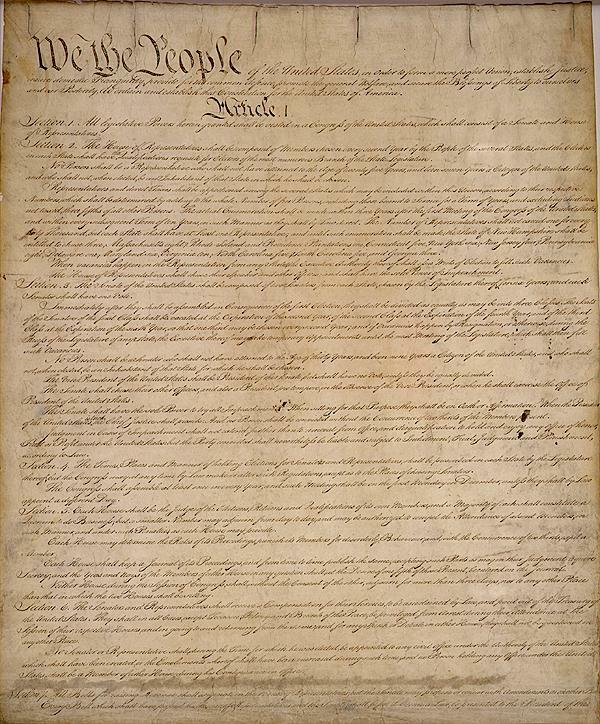 I’d love to see how many Tea Party members could actually pass a sixth-grade Constitution test. I’m guessing their candidate fron NJ would likely fail and I have a feeling that lady from Alaska might come up a bit short too. The concept of requiring a renewal of qualifications for various freedoms is not new. Numerous professionals are required to renew their licenses from time to time and in some states individuals of certain professions are even required to engage in continuing education. On the surface the argument is made that such renewals ensure that professionals – lawyers, doctors, etc., continue to offer the best care or services available. Such arguments are presented as protecting the public. Every driver in this country is required to renew their drivers license from time to time for the same reason. So, why not require individuals to renew something as important as their ability to cast an informed vote on matters affecting someone else’s civil liberties as protected in the Constitution? Therefore, I say, if you want to erase the 14th Amendment, then be prepared to sharpen the other end of that #2 lead pencil and take your own test – and yes, spelling counts. But this amendment ultimately failed falling two states short of the unanimous approval required for amending the Articles of Confederation only New Hampshire and New York were opposed ..The proposed ratio was however a ready solution to the impasse that arose during the Constitutional Convention. In the Constitutional Convention the more important issue was representation in Congress so the South wanted slaves to count for more than the North did. . Much has been said of the impropriety of representing men who have no will of their own. Support for the new Constitution rested on the balance of these sectional interests.